Over the years, we’ve seen a lot of things in the B2B mortgage realm at Mortech, Zillow’s Lincoln office, but we rarely get a firsthand look at how our services help our customers in their B2C ventures. 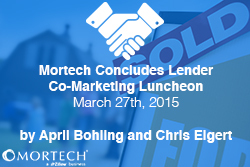 So, in order to gain some more insight into the B2C world, we hosted our first ever ‘lunch and learn’ on March 12th with two members of the Lender Co-Marketing program: Premier Agent, April Bohling, and Premier Lender, Chris Elgert. Rather than sum the event up ourselves, we thought it would be more fitting if April and Chris shared their thoughts about it..
“Last week I had the opportunity to participate in a lunch and learn panel for the employees of Mortech, a Zillow business, and provide them a glimpse into the life of a Zillow Premier Agent. First, let me just say thank you to Mortech for inviting me to be part of this event. I have always been blown away by the stellar customer service and support Zillow has provided me during my time as a Premier Agent, and during my visit, it was clear that Mortech shares the same customer driven approach. My journey with Zillow started about a year and a half ago. I was unsure of how well the program would work for me, and didn’t think the idea of “buying leads” would be the direction I wanted to take my business. After hearing about other agents who have had tremendous success with the Premier Agent program, I thought it would be worth trying out. I started out slow – I think I actually purchased the minimum amount of “impressions” in a given zip code. It wasn’t long before I was getting regular inquiries and phone calls about houses from consumers on Zillow. A short time after signing up, I had secured my first sale from a buyer I met through Zillow. I remember thinking how easy it was, and with that transaction alone, my costs associated with being a Premier Agent were more than covered for the entire year… and that was only 3 weeks in! I had to wonder, is this really how the program works, or did I just get extremely lucky? I held out in the same zip code, resisting the urge to purchase more impressions or branch out into other zip codes. I continued to have similar results, a steady stream of inquiries and every so often a buyer who was truly ready to purchase. After about 6 months in the program, a highly coveted zip code I had my eye on for a long time finally had impressions available for purchase. It was when I moved into that zip code that I was truly “all in.” Armed with resources, ideas, and information provided by my Zillow Representative, I put systems in place so my response time to inquiries was minimal and was able to consistently follow up with consumers who were on the fence about buying, or perhaps the timing was off. I have continued to upgrade my account by branching out into other sought after zip codes and utilizing other great services Zillow rolls out. Looking through the past year to present day and comparing my sales and production to my pre-Zillow days, I can say that Zillow has made a HUGE impact on my business. With an ROI currently right around 5x, it’s so easy to talk about how great Zillow is for real estate agents. Thank you, April and Chris, for taking the time out of your day to share your experiences! For more information on Zillow’s Lender Co-Marketing program, click here.